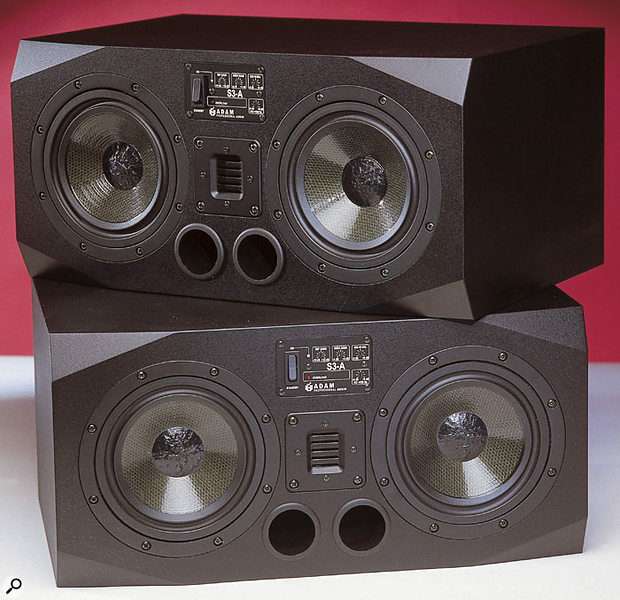 We first looked at monitors from the German company ADAM in SOS June 2003, when Hugh Robjohns reviewed a pair of their S2.5As. The company, which is based in Berlin, builds a range of professional studio monitors, it's unique technology angle being the use of proprietary folded ribbon tweeters in place of the more usual metal or fabric domes. This ART (Accelerated Ribbon Technology) tweeter claims a lower moving mass than a typical coil-powered high-frequency driver, which in turn translates into less inertia and therefore it can follow transients better. As Hugh pointed out in his review, the closest analogy is between dynamic mics, which utilise a voice coil, and capacitor mics, which use only a thin diaphragm and hence tend to operate more efficiently at high frequencies. The ribbon driver principle is similar to a ribbon mic in reverse, and utilises a conductive ribbon held within a strong magnetic field generated by a permanent magnet. Because the ribbon in a conventional ribbon driver is in effect a thin, flat sheet of metal (or other material with a conductive metal coating), the electrical impedance is typically very low. ADAM get around the limitations of these conventional ribbon drivers by using a concertina-shaped, metalised plastic diaphragm that moves the air by means of a pumping action rather than the more usual pistonic action. Because of the folded construction and the way the conductive coating is arranged, the impedance is much closer to that of a conventional coil-powered driver. A further benefit of this approach is increased power handling compared with that of a conventional ribbon driver, while the pumping action of the diaphragm couples energy into the air more efficiently than a normal piston. Yet another strength of the folded structure is that there are no cone breakup modes to add distortion at high frequencies and, because a folded diaphragm takes up little space compared to the outlet aperture it requires, it can move more air than a pistonic driver of the same aperture area. In the S3A, the tweeter's ribbon area is a huge 71 square centimetres, yet it weighs just 0.17g. Innovation isn't confined to the tweeter, though, because ADAM use Hexacone bass drivers developed by German company Elton, where the cone material comprises a honeycomb of Nomex, reinforced with a layer of Kevlar to attain the attributes of lightness, stiffness and good self-damping. The S3As reviewed here incorporate two 186mm Hexacone drivers with 39mm-diameter voice coils crossing over to an ART tweeter at 1.8kHz. Unusually, the two drivers, though seemingly identical, are not used in the same way — this is actually a type of three-way design where one woofer acts as a full-range driver from 1.8kHz down to 32Hz and the second woofer comes in from 150Hz down to 32Hz, effectively doubling the surface area of the woofer at low frequencies. The two cone drivers are powered by discrete 150W amplifiers (with over 200W peak-handling capacity) with another amplifier of the same rating driving the tweeter. Photo: Mark EwingThe combined outcome of this engineering ingenuity is a 500 x 240 x 320mm monitor with a frequency response extending from 32Hz to 35kHz (±3dB) and with an SPL capability of 112dB/W/m. 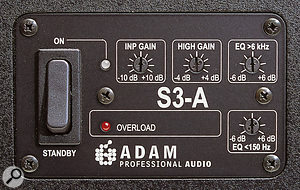 As with the S2.5As, the specifications claim a total harmonic distortion of below 0.5 percent above 80Hz. The cabinet features two reflex ports and weighs 16kg. It may be mounted horizontally or vertically, provided that the pairs are arranged as mirror images. The cabinet corners have a distinctive chamfer that may help avoid edge diffraction, as well as looking good! The ART tweeter sits behind a centrally-mounted grille, below which are the two bass ports. A panel offering some frequency adjustment is mounted directly above the tweeter grille. At the rear of the cabinet is a substantial heat sink, an IEC mains inlet and a power switch. The signal comes in on a balanced XLR. Frequency adjustments are made via the four slotted rotary controls on the panel above the tweeter, where the input sensitivity can be tweaked by ±10dB and the tweeter gain can be adjusted over a ±4dB range. The two remaining controls provide ±13dB of room EQ at 6kHz and 140Hz, though I conducted my review with all frequency tailoring screws set flat and had no cause to adjust them. Hugh Robjohns compared the S2.5As to his beloved PMC monitors and found them just slightly bright unless the frequency trim controls were adjusted (though he apparently still really liked them), which tends to make sense, as I recall comparing the various ADAM monitors at a trade show and finding the S3As subjectively more neutral sounding than the unadjusted S2.5As. I normally use Mackie HR824s in my own studio because they suit the room and produce mixes that translate well on other systems, so I replaced these with the S3As and used them for some weeks to try to get a feel for how they worked on a range of material. My first impression was that the S3As had a similar overall tonal balance to the Mackie HR824s, but with more smoothness and finesse at the high end and a better ability to resolve what was going on in the mid-range. The depth of bass was excellent, but, as Hugh commented, it doesn't seem as though it's going as low as the spec claims, but one reason for this may be that the bass is very clean and well-controlled, and listeners often perceive slightly distorted bass as having more depth and power. Certainly I have no complaints about the bass end at all. It goes as deep as you could wish for in a medium-sized control room, delivering a real kick, and you can hear all the individual notes in a bass part with no mush! The stereo imaging was as good as anything I've tried that's been of a comparable physical size (boxes set up horizontally) and right away I felt I had a sound I could work with without needing any period of acclimatisation. I've used a lot of monitors over the past few years, but these felt inherently 'right' from the moment I first heard them. I had no problem with any of the sibilance issues Hugh reported with the S2.5As and I've since worked with these speakers on pretty long sessions of both acoustic and electronic music without any fatigue. The S3As are not cheap monitors in the UK, but then neither are they the most expensive we've looked at. Of all the monitors I've tried in this size range, they're definitely amongst the very best and combine an ability to present depth of bass with a clarity which reveals fine transient detail without any hint of edginess and without clouding the mid-range. 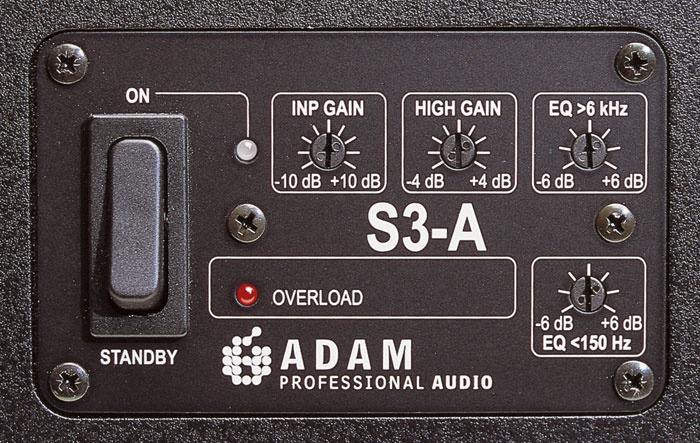 ADAM's ART tweeter system certainly seems to live up to its claims and, overall, the system performs brilliantly right across the frequency spectrum with no significant vices. Perhaps most importantly, mixes made on the S3As sound well balanced when played on other sound systems, which ultimately is what studio monitors are for. Pristine sound quality right across the audio spectrum. The S3As are very serious monitors that compare well with the best available. Although they may seem expensive, they still represent great value given their performance.